I had worked up an appetite following my trip to Lantau island, so I wanted to find a place where I could grab a bite while also being able to mingle. 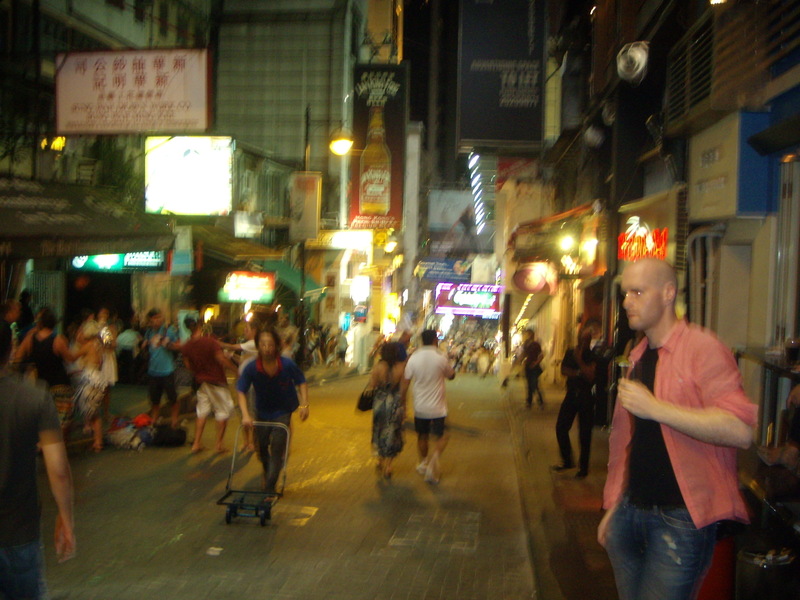 Lan Kwai Fong seemed to be the perfect place to do that, so I walked there from Hong Kong Central Pier. Only occasionally missing a street or two and having to reorient myself by following a map, it took about 20 minutes to get there. 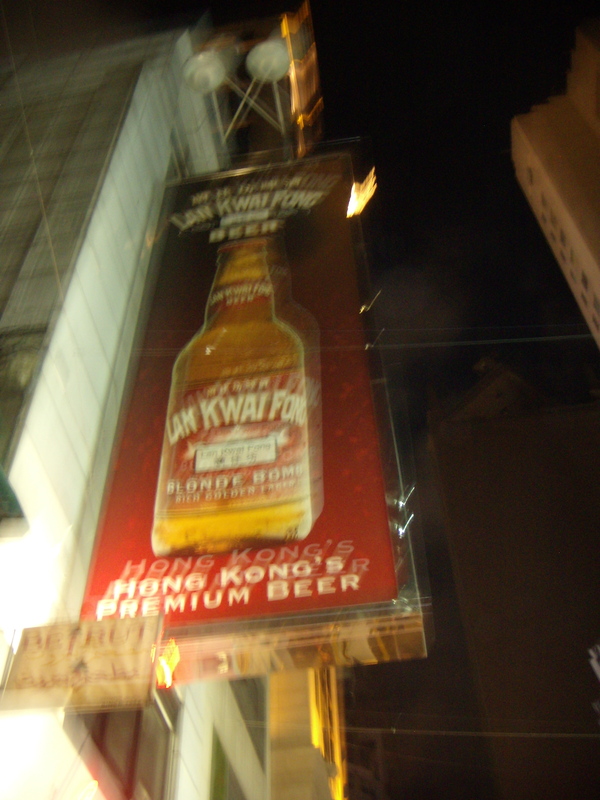 Lan Kwai Fong is a street filled with bars, clubs and restaurants, essentially Hong Kong’s party central, located near the main part of the city where business executives and prominent financial players go to work each day. 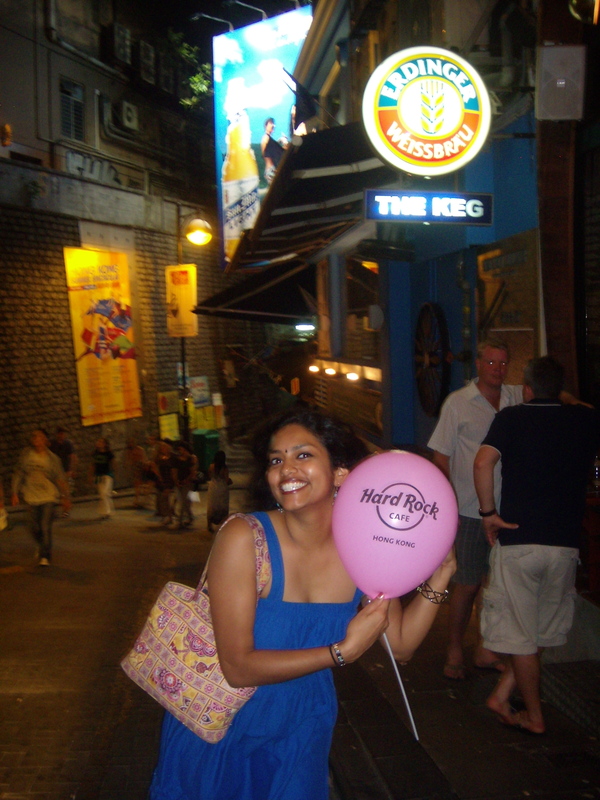 Again, since I was traveling alone, I wasn’t about to go clubbing or bar hopping by myself, so I went to the Hard Rock Cafe. I needed to buy my sister a Hard Rock Cafe souvenir pin anyway. She has a collection of pins from cities around the world, so anytime anyone in my family goes somewhere, we try to stop by to add to her collection. 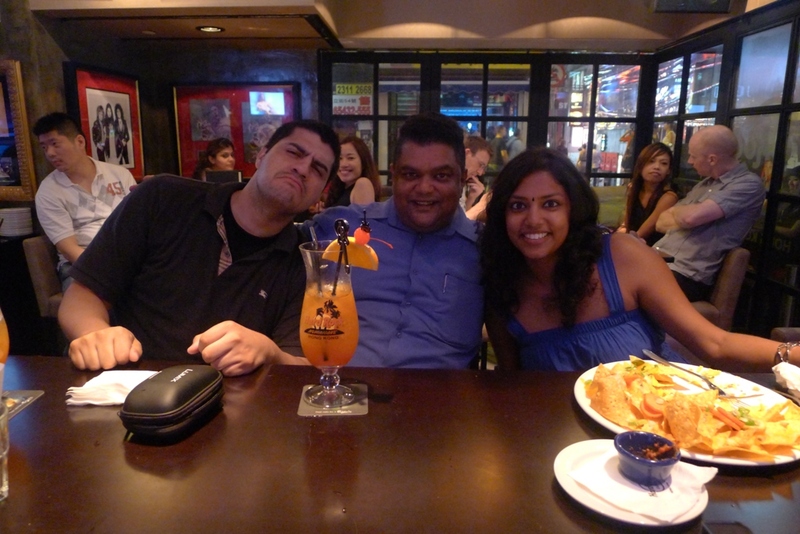 As I scarfed down a plate of nachos, I met two gentlemen who said they were in town visiting Hong Kong from Guangzhou. They’d made a day trip and would be taking the train back at the end of the night, they said. One of them worked for FedEx, and the other, for some kind of wine packaging and distribution business, if I remember correctly. The younger of the two was one of those people who can strike up a conversation with absolute strangers and talk to them as if he’d known them for years. The other man, Vin, was Indian, so as I told him about how I’d just been working in Guam for two years and would be on the job hunt once again, he asked me I’d ever work in India. We talked about modernization in India, and discussed the job market there and growth the country has enjoyed compared to other places. However, the debate over India’s rate of growth and when it will outpace China continues because India’s GDP estimates can’t be taken at face value. We all decided to check out some of the other establishments along the street after finishing our food, but I told them I had to stop by the restaurant’s gift shop first to get the souvenir. To that, the younger of the two (his name has slipped me at the moment) turned to our waiter and squarely asked if he could spare some of his flair to give to me, since he was wearing so many buttons already. With some reluctance, the bartender obliged. Boom. Just like that. Me wearing my newly acquired Hard Rock pin courtesy of the restaurant’s bartenders. 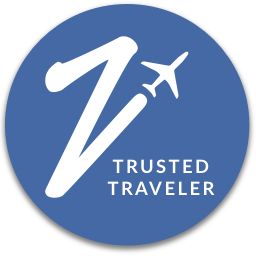 Why pay for souvenirs when you can get them for free? 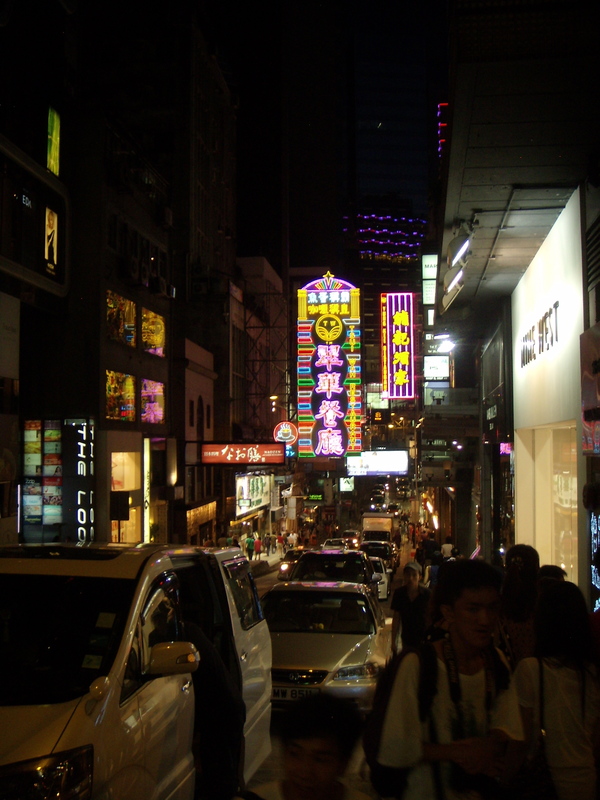 Strolling along Lan Kwai Fong, Hong Kong’s entertainment and nightlife hotspot. From Hard Rock we stopped at two places. The first was an 80’s/90’s bar that played music videos that didn’t match the music that the DJ was actually playing. It reminded me of the karaoke joints back in Guam, where a shoddily produced music video of some sappy love song would accompany the heavy metal rendition of what your friends would be singing. This bar didn’t even have new songs available when I requested it. No Ke$ha? Seriously? Bummer.